Even Song never got going and Seamie Heffernan made the most of his opportunity. AIDAN O’BRIEN CLAIMED the fifth Irish Oaks of his training career when 14/1 shot Seventh Heaven got home first under Seamie Heffernan. Seventh Heaven was available for up to 25/1 earlier today and became the seventh Irish trained and bred Classic winner of the year, winning with two and three quarter lengths to spare over Hugo Palmer’s Architecture, the mount of Frankie Dettori. Harlequeen completed the minor placings after Mick Channon’s filly made up ground late on. Pretty Perfect, another of O’Brien’s runners, set the pace early on, paving the way for Seventh Heaven to surge home from two furlongs out. O’Brien’s Even Song had been the heavy 4/5 favourite to take the honours today but never got going under Ryan Moore, and Heffernan couldn’t believe his luck. “It was a Group One and we went at a Group One pace,” Heffernan told At The Races. “I was always travelling great, but if you’d given me the choice before the race I’d have given back half the prize money to ride Even Song. Email “O'Brien lands Irish Oaks with 14/1 shot Seventh Heaven”. 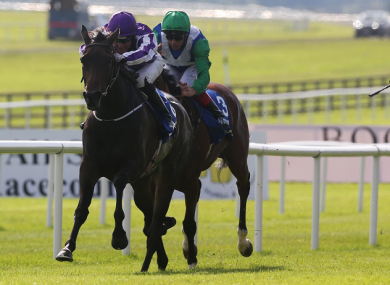 Feedback on “O'Brien lands Irish Oaks with 14/1 shot Seventh Heaven”.